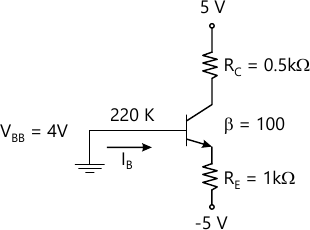 1 (a) Draw Input and Output characteristics of BJT in common emitter configuration. 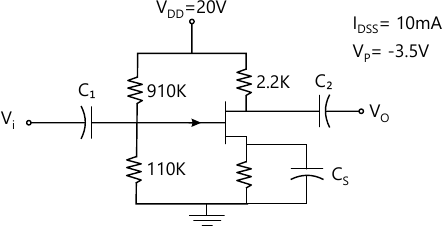 (5 marks) 1 (b) Draw small signal hybrid π equivalent circuit for npn transistor. (5 marks) 1 (c) Explain effect of temperature on JFET and derive equation for zero current drift. (5 marks) 1 (d) Calculate IB, IC & VCE for common emitter circuit. (5 marks) 1 (e) Find IB, IC & VCE for following circuit. (5 marks) 2 (a) Draw output waveform for clamper and clipper circuits. (10 marks) 2 (b) Explain construction & characteristics of n channel Enhancement MOSFET. Draw transfer characteristics & drain characteristics. 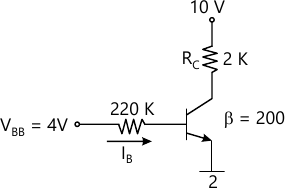 (10 marks) 3 (a) For JFET amplifier shown below, Calculate Av, Zi, Zo. 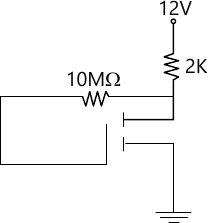 (10 marks) 3 (b) For the circuit shown below, calculate IDQ & VDSQ. 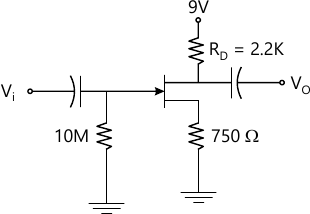 It is given that ID(ON)=6 mA, VGS(ON)=8V. Vth=3V. (10 marks) 4 (a) Explain the working of Wein Bridge Oscillator. Derive the expression for frequency of oscillation for sustained oscillations. (10 marks) 4 (b) Calculate voltage gain of FET amplifier.